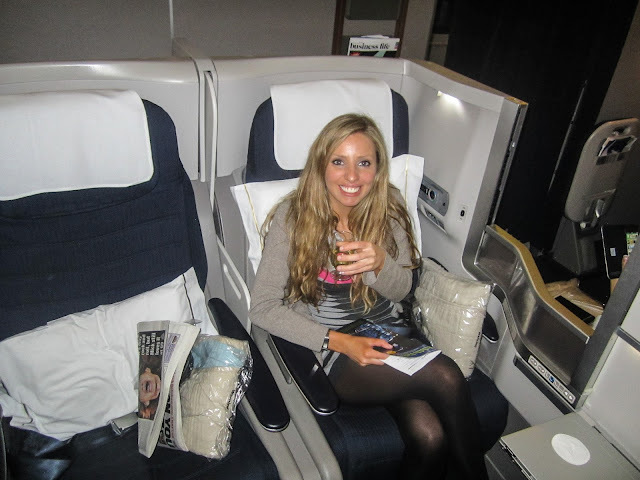 Best Business Class - by Travel Bloggers - What's Katie Doing? Hello and welcome to my first collaboration post. 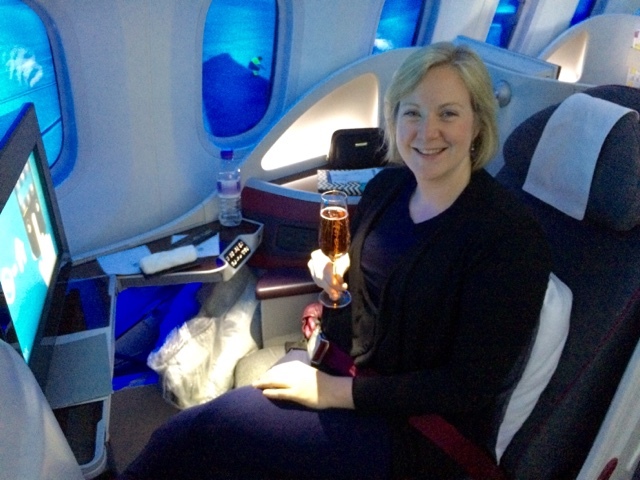 After some recent work trips where I got to try out both Emirates and Qatar Business Class long haul, I wanted to see what experiences others have had and how the airline’s Business Class offering stacks up. 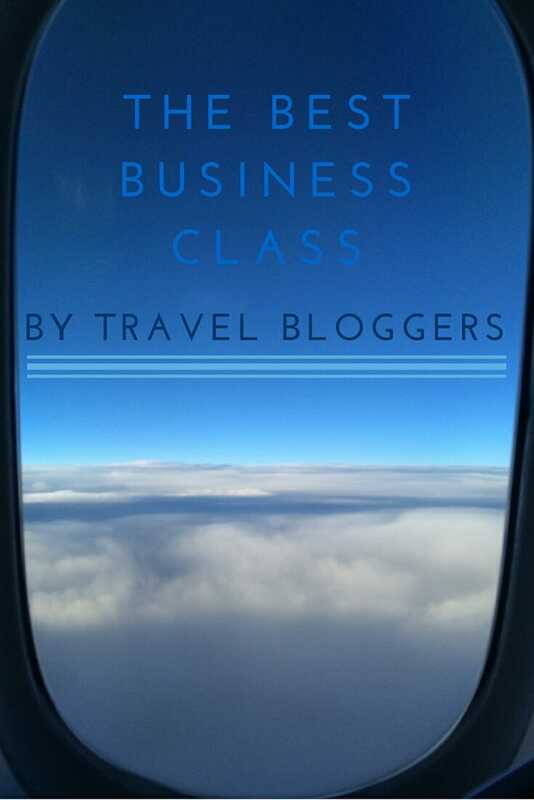 So I asked fellow Travel Bloggers, Angie from Silverspoon London and Marie from Luxury Travel Blog to share their experiences on Business Class flights. I always travel with British Airways as I have a loyalty card with them and plenty of points saved up. I also like the high standards of quality and service offered by the airline. There is no chauffeur service, but there’s a dedicated desk for club class meaning shorter queues for check in. Fast track through passport control, very friendly and efficient staff complete the check in experience. I really like the British Airways Business Class lounge at Heathrow. The food is good quality, plenty of choice and the public area is up to date and well serviced. For long haul flights there’s a flat bed which is comfortable. I do think that the layout of the plan isn’t always practicable as you have to step over other people to get to the aisle. I usually find the food of good quality, though I generally choose the healthy option which is often cold. I’d like to see more healthy options served as a hot meal. The meal is served at a set time though in first class you can have it whenever you want. Good selection of drinks! You receive a decent wash bag but not much else in Business Class. First class amenities are better. Time goes by and I find First or Business Class travel is essential as I get older. Nowadays, I would rather stay at home if the only choice was Tourist class flying! 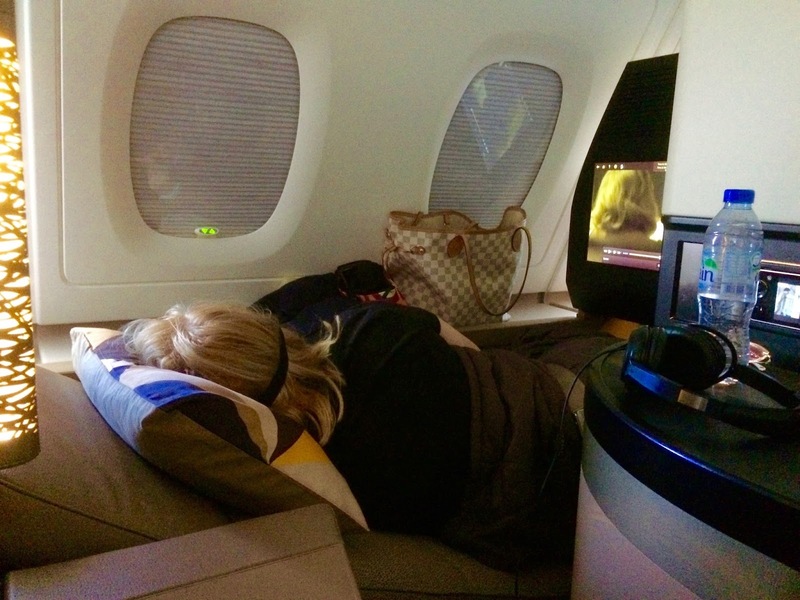 Marie enjoying her flat bed in Etihad Business Class to get a decent sleep! The joy of a complementary Etihad driver with a comfortable Mercedes whisking me away from my front door with a mountain of luggage is unsurpassed. Especially on those cold, frosty mornings, the knowledge that we won’t be freezing cold in an airport carpark struggling with luggage is a real treat. Glide through fast track and settle into the calm, luxurious Etihad Business Class lounge. Choose a delicious snack or meal and settle back in a quiet, refined environment to await the flight. You will feel relaxed and calm, especially if you indulge in a massage or manicure at the Spa in the lounge. Step aboard and into a quiet and tranquil plane, especially the A380 – the best Business Class plane in the world – with your own private little area which turns into a flat bed at bedtime. In the meantime you are spoiled and pampered by the best Air Stewardess who will serve meals as and when you want – no set mealtimes here. Etihad food is the best airline food, without doubt. The Seafood menu is especially perfect for a non-meat eater like me. 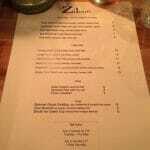 The wine list would be at home in the finest Michelin starred restaurant. Marie, Luxury Travel Diva writes for http://www.luxurytraveldiva.com covering her trips around the world, the good and bad experiences. Helping people to make informed choices when choosing an expensive holiday, she is a writer for several worldwide publications including in Russia and UAE. You can follow Marie on Twitter, Facebook and Instagram. Whilst Emirates also provides a chauffeur service to and from the airport for Business Class flyers, this isn’t something I’m going to hold against Qatar, who I think provide a superior service. As with all the airline check in’s, Qatar has a dedicated check in for Business Class and this means zero queues. The fast track through Heathrow security wasn’t as fast as expected, due to numerous passengers with access, but it was probably better than the economy queues. Once inside the lounge you realise that the service is personalised, there is no buffet option here, but instead the staff provide menus and take orders for you. Whilst the lounge at Heathrow isn’t as extensive as British Airways or Emirates, it has everything you need – including a martini bar! (I didn’t indulge last time as I was travelling for work and needed to sleep on the plane, but I will plan a martini stop next time I fly) and of course their lounge at Doha airport is the flagship lounge. 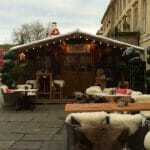 I made liberal use of their shower facilities, restaurant & bar! The air stewards greet you personally and are so friendly. 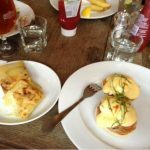 They provide the requisite drinks – champagne for me – and let you get settled into your seat, before confirming if you would like meal(s) and when. The choice here is yours on when you eat and the selection was decent. The wine list was well paired with the food choices too. The beds are flat and the layout of the cabin (reverse herringbone) means that everyone can access the aisle without stepping over and annoying your neighbour (something that I found defeated the point of having a flat bed when trying to sleep on an Emirates flight in the A380). As well as the standard wash bag you can get pyjamas to change into when you want to sleep, something that is standard on First Class for other airlines. 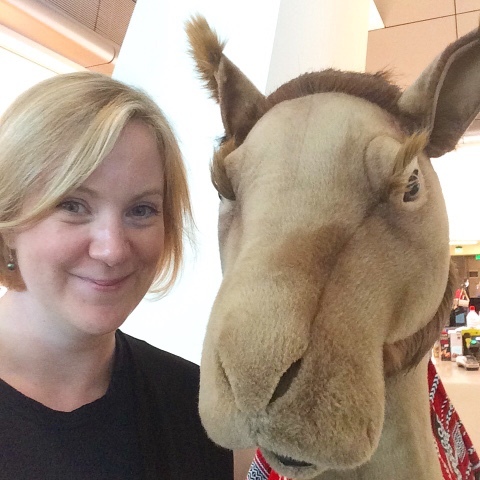 My new friend in Doha airport! Don’t forget to keep up with What’s Katie Doing? via Facebook, Instagram and Twitter. So what is the best Business Class? It really depends on what you’ve experienced! Each time I travel Business or First is a whole new experience and spoils you for the next one where something isn’t quite perfect. Obviously the best Business Class is one you don’t have to pay for, so make sure you collect those air miles! 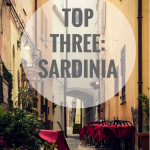 I'm so pleased to collaborate on this blog – enjoy reading! Thank you for the collaboration Katie! I would be happy to travel on all three airlines anytime in business. Thanks for collaboration Marie! Now I want to try Etihad and also First Class #flightgoals! Totally – I really want to check out Etihad and also at some point experience first class! Though I have never travelled in First or Business class, I am starting to hear you out very well. While I was reading about BA, I was thinking – I hope there's something about Etihad/Emirates or QA. The last three are so unbeatable and so relentless when it comes to winning new customers. I know the whiff of gas and the abundant amounts of petrol speak here, but still they are doing an amazing job catering to every need of their respected clients. Hi Svetoslav – I've also been on the A380 with Emirates where the whole topdeck is business and has a bar at the back. Whilst there are perks being with such a large airline – direct access to the plane from the very plush and generous lounge for example – Qatar has won my heart with the customer service! I would totally recommend them as the attention to detail is great and you get personal tailored service. Interesting article but to be honest I wouldn't choose the first class unless I have unlimited founds… I always find so many other things I could spend this money on! Must be nice! I've never traveled via business class but I'm hoping to try it next time I travel. I've heard great things about Qatar. Once you've travelled business you won't want to go back to economy Janna! Love this post! My top international business class carriers are definitely Qatar Airways and Air New Zealand. Ah I love Air New Zealand too Kristina! All of these are making me want to travel in business class! I think I might have to for my next international flight because economy can be so uncomfortable! Once you’ve done it once you won’t want to go back Julia!